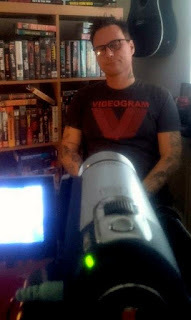 I'm excited to announce that I finished up my interview for Tony Newton's documentary VHS Lives: A Schlockumentary earlier this week! Focusing on VHS, SOV movies and VHS collecting, my interview focused mainly on the format, but there's some information about Videogram thrown in as well. I couldn't be happier to on board for this one! The documentary's got a great cast, including renowned UK artist Thomas Hodge aka The Dude Designs, and there's more to be announced in the near future! Produced by Vestra Pictures, the documentary is slated for release in early 2017. More info via their IMDb page here.